Nowadays, outputs of the global climate models (GCMs) are extensively used as inputs for the crop simulation models (CSMs) to assess the impact of climate change on different agricultural crops. As the skills of GCMs and CSMs are not at per for decision-making at local scale, particularly in distract level due to the coarser resolution of GCMs and limited ability of representing the regional scenarios through crop models, so GCMs have to be evaluated to test its ability for reproducing the local scale climatic mean features and crop model has to be calibrated and validated with local scale experimental data before its application for climate change studies. 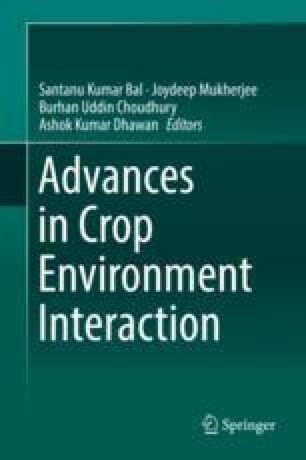 The present chapter describes how the combined influence of climate and crop models are able to provide useful information for policy-making at subregional or local scale. First part, the centennial scale (1901–2000) district-wise rainfall change over West Bengal state for four distinct seasons and annual scale has been quantified using station data as well as GCM simulation. Based on the ability of GCMs to simulate observed rainfall, a group of better performing models is identified for North and South Bengal districts separately for using an input for any decision-making research. Percentage change (with respect to 1971–2000) of future annual monsoon and pre-monsoon season rainfall in different short-term (30 year) and long-term (100 year) periods revealed a decreasing trend of rainfall by 16–25% over South Bengal and 1–15% over North Bengal districts, while the winter and post-monsoon rainfall were projected to be increased by 60–117% and 1–15%, respectively, over North Bengal. Future temperature is always showing increasing trends in different time periods in different parts of the world as well as in Indian subcontinent. An attempt has been taken to investigate how the increasing trends of temperature, increasing/decreasing patterns of rainfall as well as elevated CO2 can alter the productivity of rice crop over the Gangetic West Bengal region through a crop simulation model of rice, popularly known as ‘ORYZA2000’. It is revealed that rice production decreases by about 10% with only 1 °C rise in temperature and current CO2 level, while it increases by 10% under 1 °C rise of temperature and doubling CO2 concentration. It is further noticed that productivity of rice will fall by 30% with a rise of temperature by 2 °C and doubling CO2 level.